On the 5th of September, celebrated in India as teacher's day, a special programme was organised by the university in C-block auditorium. The event began with the ceremonial lighting of the lamp by the guests of honour while a choir of students delivered a melodious "Saraswati Vandana". Following which all faculty members in attendance were welcomed with bouquets and presented with miniature Madhubani paintings made by the students. A welcome address was presented by Prof. C.S.Rai, Director, Student's welfare, who expounded on the importance of teachers and their appreciation on the occasion of Teachers' day. The event was presided over by Prof.K.Vijay Raghavan from USBT who spoke on the importance of teachers' in nation building, emphasizing the instructional as well as inspirational role they play in the lives of the youth. In keeping with the spirit of teacher's day of appreciating talent and dedication to the noble profession of an educating, an exceptional member of the USS faculty, Prof.Satyabrata Mahapatra, was felicitated with the "Faculty achievement award" by the chief guest. Prof. Anil Tyagi, Vice Chancellor, then addressed the gathering and announced the launch of the "Online EWS Portal", an electronic system to provide and streamline the process for granting financial assistance to students belonging to economically weaker sections of the society. The honourable Vice-Chancellor then shared a humorous anecdote from the student life of famed Dutch physicist Niels Bohr and his legendary responses to the question of how a barometer can be used to measure the height of a building. The chief guest was then felicitated by Prof.Tyagi and a colordful Madhubani painting was presented to him as a memento. Finally, a vote of thanks was delivered by Prof.Nimisha, expressing gratitude to the team of student organizers and all faculty members present. The event ended with an invitation to high tea for all attendees. 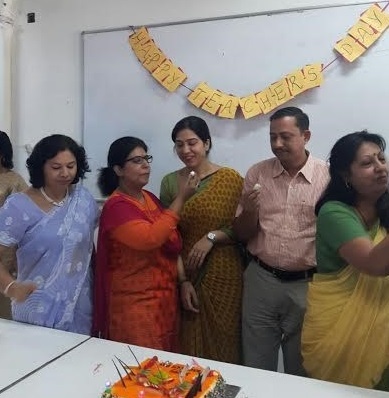 On the same day, a small departmental celebration was held in the University School of Education, with faculty members of the school being felicitated by Med. scholars. The teachers expressed their joy and were pleased at the display of gratitude by the students. The festivity concluded with the cutting of a cake, and snacks enjoyed by all.